Politics in Thailand is never far from the surface. Although described as peaceful, there was at least one death and scores of injuries. The following report is from The Nation, one of Thailand’s english language newspapers. 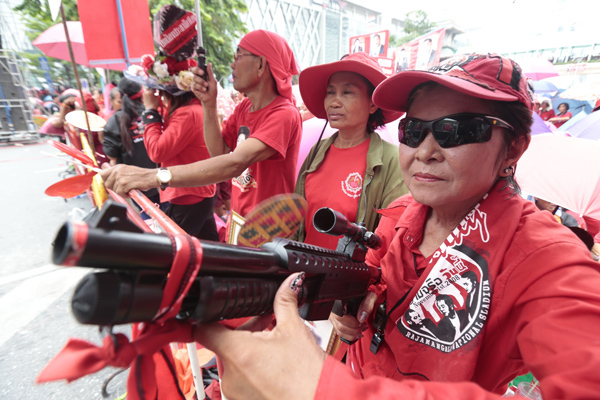 BANGKOK, May 19 – Red Shirt protesters on Sunday gathered at Bangkok’s prime commercial area amid tight security to mark the third anniversary of the May 19 protest clampdown in 2010, which resulted in scores of deaths and injuries. The supporters of the red-clad, United Front for Democracy against Dictatorship (UDD), began gathering since morning at Ratchaprasong intersection, their main rally site against the Abhisit Vejjajiva administration three years ago. They laid wreaths in front of nearby Pathumwanaram Temple to commemorate those who were killed during the security operations in 2010. Former prime minister Thaksin Shinawatra is scheduled to make a phone-in address to his supporters at around 8.30pm tonight. The deputy spokesman of the ruling Pheu Thai Party on Sunday urged former premier Abhisit Vejjajiva and his deputy Suthep Thaugsuban to formally express their condolences to the families of the May 19 victims. National Security Council secretary-general Gen Paradorn Pattanathabut said that, as of now, there are no reports of possible violence at the rally site, while security measures have been implemented to maintain law and order. Gen Paradorn also brushed aside the so-called “double-standard practice to handle the mobs, saying that security-concerned agencies have applied the same standard of practice to every group of protesters. Eighteen companies of police officers have been deployed in the protest site and screen for weapons at the venue. Police said the rally organisers have pledged their activity will end by midnight. At least 20,000 supporters of the United Front for Democracy against the Dictatorship (UDD) converged on Ratchaprasong in Bangkok on Sunday to commemorate the lethal crackdown against anti-government protesters three years ago. The number was well short of UDD leaders’ promise of 100,000 but beat estimates by the Metropolitan Police Bureau (MPB), which expected only 10,000 to turn out. More were due in the evening when fugitive former prime minister Thaksin Shinawatra planned to talk over Skype to the rally. CentralWorld shopping mall, badly damaged in the protests three years ago, closed at 1pm as traffic in front of the complex was blocked for the rally led by key UDD leaders including chairwoman Tida Tawornseth. Security chiefs including Deputy Prime Minister Chalerm Yubamrung and National Security Council secretary-general Lt Gen Paradorn Pattanatabut showed no concern about the Bangkok rally as it had been peaceful. The MPB deployed at least 700 police to keep the rally in check and strictly screened demonstrators for implements that they wanted to take into the site. More police could be called in if necessary, Pol Maj Gen Chanthawit Ramsutra, the MPB deputy commander, said. Robert Amsterdam, a lawyer for Thaksin, took the stage to call for the release of all political prisoners and those serving time for violations of the lese majeste law. He also attacked Democrat Party leader Abhisit Vejjajiva for his book “The Simple Truth”, saying it was fictitious. Mr Abhisit was the prime minister at the time of the crackdown on May 19, 2010. Mr Abhisit wrote the book to defend his actions during the protests, saying that without the men in black, there would not have been fatalities. When the protest finally ended after the crackdown, 91 civilians and soldiers were dead. Sa-nga Khunyosying, an UDD leader in Prachin Buri province, said about 500 members of the group decided to join the rally to call for justice and present a show of force against dictatorship and military coups. “We’ve come with two banners protesting against Abhisit Vejjajiva and urging the Constitution Court judges to resign,” Dr Sa-nga said. Suriyasai Katasila, a coordinator of the Green Politics group, on Sunday challenged the red shirts to ask the deposed former prime minister Thaksin questions relating to his alleged involvement in the deaths and losses of that incident. It was time to throw some questions at Thaksin whom he described as the man who had complete decision-making power behind the protest. Mr Suriyasai accused Thaksin of ordering the rally to carry on and did not try to stop the protest to avoid bloodshed. He said the purpose of the planned reconciliation bill, which has six sections, was more than annulment of all convictions and punishments against Thaksin but the return of Thaksin’s 46 billion baht in assets seized from him after his conviction. “I ask the red shirts to Skype and ask Thaksin [these questions]. The time is up for only listening to what he says when he Skypes,” Mr Suriyasai said. Earlier on Sunday morning, an elderly woman who travelled to Bangkok overnight to join the red shirt rally collapsed and died at Wat Pathum Wanaram, just before the street rally began. Pol Capt Chanintorn Nguanson, the duty officer at Pathumwan police station, identified the woman as Khaikee Wongrasri, 68. Thongdee Mainoi, a relative, told police that she had travelled on a tour bus with Mrs Khaikee and other red shirts all Saturday night from Sakon Nakhon to join the Ratchaprasong rally. On arriving at Wat Pathum Wanaram close to Siam Square at about 5am, she and Mrs Khaikee were walking to the rest room. The older woman complained she was tired and sat down. She suddenly fell unconscious and stopped breathing, Mrs Thongdee said. The body of Mrs Khaikee was taken to the nearby Police General Hospital for an autopsy. A highlight of the rally was a Skype phone in on a giant screen by ex prime minister Thaksin Shinawatra from exile. Ousted premier Thaksin Shinawatra said the government’s amnesty efforts must focus on absolving red shirts facing legal action in connection with the 2010 political violence rather than protest leaders or even himself. It would not matter if an amnesty bill exonerating political offenders was passed into law that did not also benefit protest leaders, he told red-shirt supporters in a one-hour Skype address last night. “Let the innocent people be exonerated. There is no problem if red-shirt leaders and I are not included [in the amnesty bill],” Thaksin told about 26,000 red shirt demonstrators.